Jewelry is one of my biggest loves, you will never catch me leaving the house without the adornment of at least one bauble, though typically it's more. 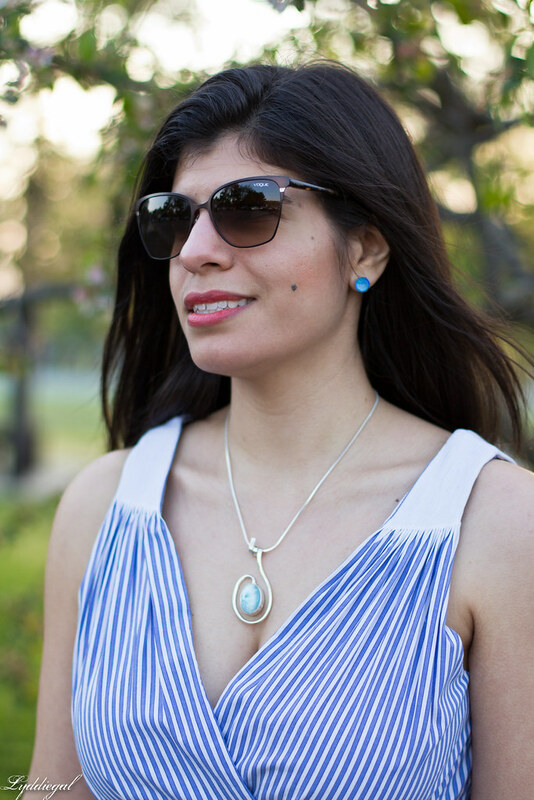 I'm always drawn to unique pieces, so the Larimar stone, a rare blue variety of a stone from volcanic rocks found only in the Caribbean waters in the Dominican republic, seemed like it was the perfect addition to my collection. Larimar.com kindly gifted me this beautiful Larimar Pendant, one of many stunning designs, all with sterling silver settings. 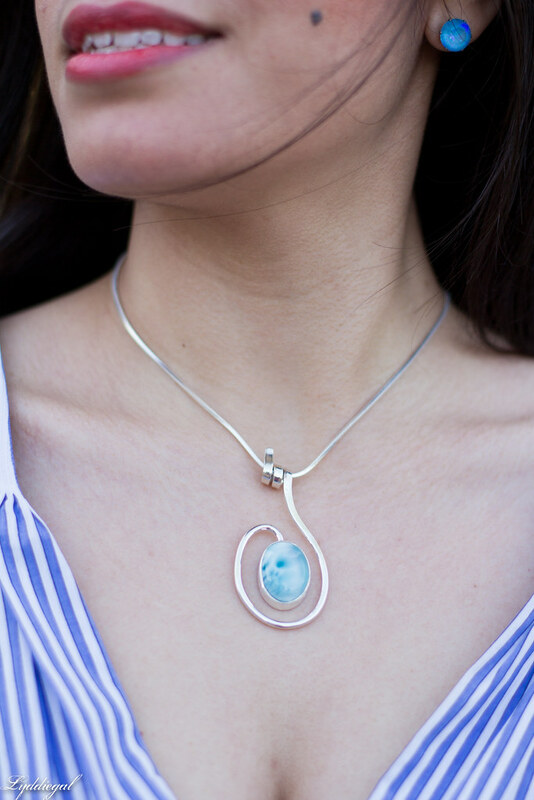 The blue stone is considered a throat chakra, which helps with communication. What better stone to adorn my decolletage? 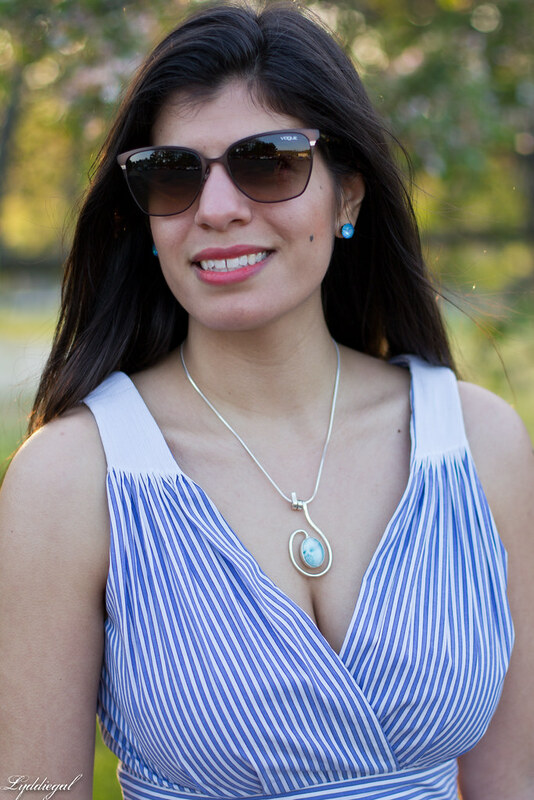 Larimar.com provided me with this pendant for the purpose of this post, my views and opinions are my own. You look stunning, in love with this top. The pendent is absolutely gorgeous but I am dying over your top! How cute is that?? And of course, Chloe adds so much fun to your photos! That's such a stunning piece - the color is just brilliant and it looks wonderful on you! I love this top, very pretty and of course you know I am a fan of the Ferragamos. Gorgeous necklace! I love unique jewelry that no one else has! 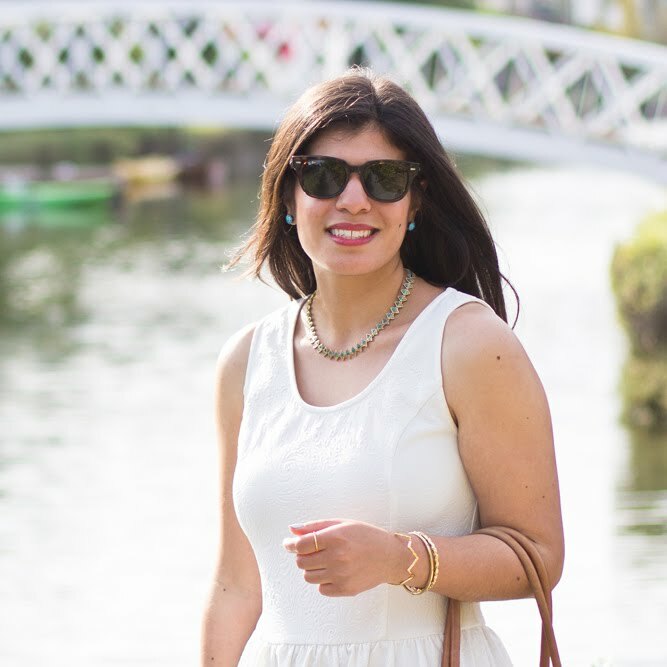 I also adore that little top, it looks perfect with white jeans. Can't decide which I love more, the top or that pendant! Both so pretty. That pendant is fabulous---the stone is gorgeous, but the metal around it is so interesting (actually it looks like a "j" to me, so maybe I should wear it? Ha ha)! 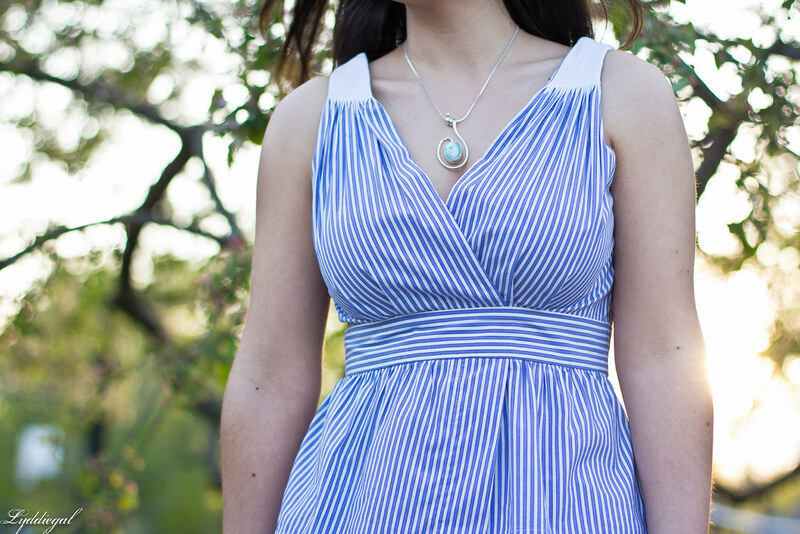 That necklace makes such a beautiful statement piece! It definitely draws attention. Love everything about that top, Lydia! Such a stunning look! 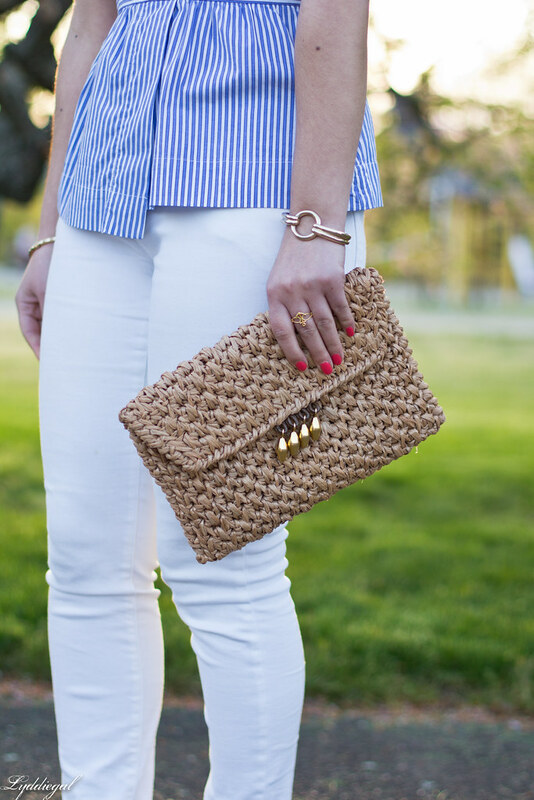 Love the top and straw clutch! Chloe is just the cutest accessory ever - I have to say that every time she makes an appearance :) But I admit, that striking blue pendant does come a close second. 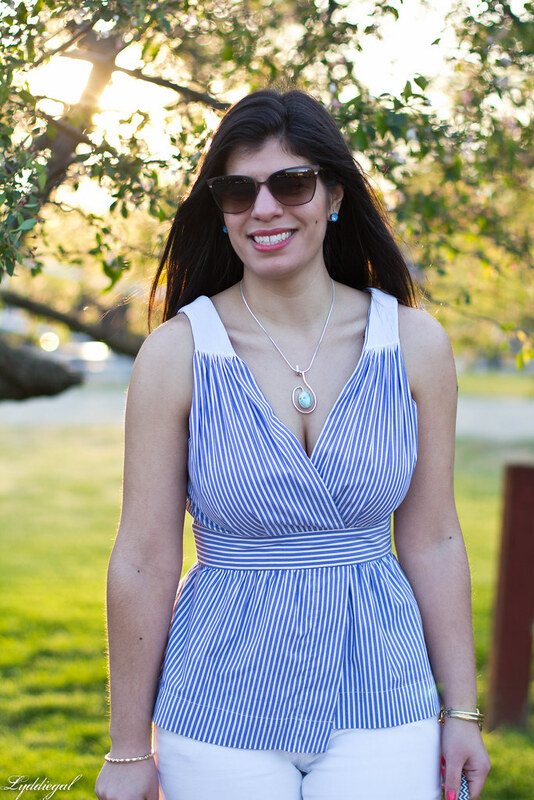 The blue shades in this look suit you just beautifully, and as a fellow jewelry enthusiast, I can absolutely understand the idea of never leaving the house without one (or many more) pieces on! I love jewelry with a story, and that's such a gorgeous piece! 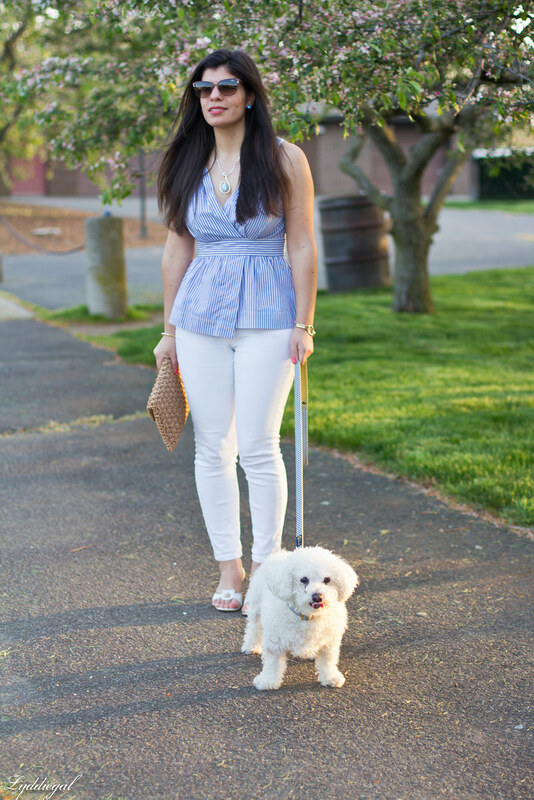 You look so pretty and summery here with your crisp blue top and white jeans!